An organic white winter wheat vodka grown, distilled and bottled on the same farm in upstate New York. Notes: A new distillery in Ovid, New York ( north of Ithaca, New York if that helps anyone) just opened up and is already producing a number of excellent products after just 5 weeks of operations. The new distillery is Myers Farm Distillery which is an organic farm to flask distillery that grows, harvests and distills and bottles their own organic distillates right on their own farm. You can’t get much more organic, low carbon footprint than that. Their products include their Meyer Farm Wheat Spirit White Dog, Myer Farm Corn Whiskey White Dog, Myer Farm Gin, and this their Myer Farm Wheat Vodka. An Aged Wheat Vodka has been laid down and currently aging for sale at a later point to be determined. Established in 1868 the farm is a family farm of roughly 1000 acres that grows organic grains and just recently they caught the distilling bug. Grown on their farm the organic white winter wheat is a softer and more unusual wheat than the more common you usually encounter in distilling. 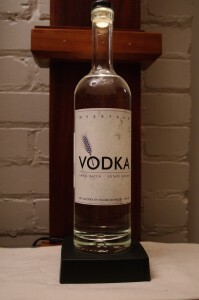 First Impression: Nice grain smell, deep full wheat not – not the thin cutting notes a number of other wheat vodkas have. Taste: Wheat grain, pepper and mint, sweet for a few seconds then drying cereal notes kick in. Mild glow afterwards. Drinks: Works well in most of your standard vodka cocktails. Bottle: Tall cylindrical clear glass with simple but tasteful paper labels( easily soaked off to reuse/repurpose the bottle later). Nice heavy glass with decanter type bottom gives it a nice balance and appearance. Nice synthetic cork with topper make bottle easy to open but gives a tight seal. Other: Made in a Christian Karl copper pot still with multiple columns. Final Thoughts: A decently made organic vodka for a reasonable price. Far better than some of it’s competitors but in the overall vodka spectrum we’ve had better. Will be interesting to see if they get better with time and experience.